Invacare absolute cushion offers a simple and comfortable solution for individuals with mild support and positioning needs. 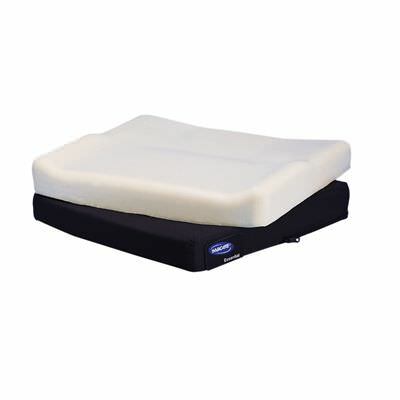 Absolute cushion is designed to provide basic comfort using dual-firmness highly resilient foam and is intended for individuals who are able to perform their own weight shift for pressure relief. Non-slip bottom - Keeps cushion secure and in place. Gentle contour - For comfort and centering in the seat. Shaped cushion bottom - Allows use of cushion on taut sling upholstery. Lightweight molded polyurethane foam - Provides comfort and durability. Outer cover - Breathable water repellent cover to protect foam and keep the consumer dry and mesh fabric effectively dissipates heat and moisture. Overall width 16", 18", 20"
Height at leg trough 2"